As if the experience of flying wasn’t bad enough, now a large portion of people in this world had to worry about being detained this weekend because they are Muslim. This comes as a result of a brash new executive order from our oligarchy. The idea is that the order is supposed to keep us safe while we asses our vetting process for immigrants entering the country. Of course, one could hardly be blamed for being suspicious of these actions given the “us vs. them” rhetoric that was spewed during the presidential campaign. And so, we the people came together to protest. While it was on short notice, crowds flocked to airports across the country with makeshift signs and high spirits. 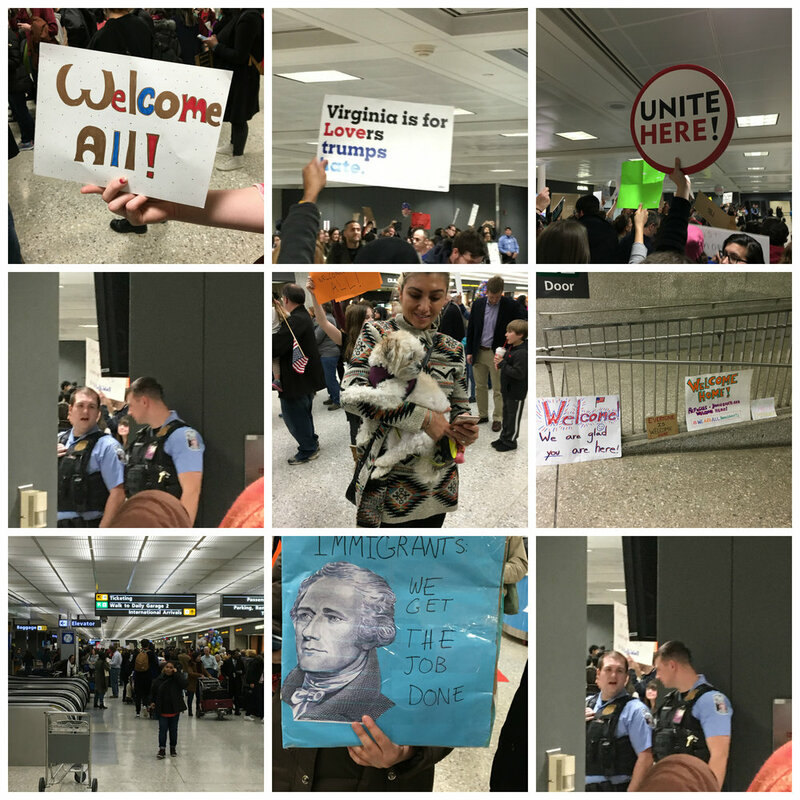 Every person I met at Dulles International Airport on January 28th was polite, educated and caring. The sentiment was clear — America is already great because of our acceptance of all races, religions etc; xenophobia of any kind will not and should not be tolerated. For roughly the 2-3 hours that I was there, chants rang loud and fierce. There must have been roughly 1-2 thousand people at any one time crowding around the arrival gate. The most touching moment came when protesters sang “This Land Is Your Land,” before quieting off and quickly coming back to another chant. The entire experience was peaceful with a decent amount of guards guiding individuals towards where they could and couldn’t stand. I leave this post with one thought. While crowds amassed and cheered for ever individual who passed through the arrival gate, some travelers did their best to avoid eye contact with the crowds while others embraced the warmth and seemed to do their best to say thanks while dragging their luggage behind. Regardless of how the protests were accepted, EVERYONE was just trying to get where they were going. Next Post Mighty Morphin Alien Rangers – Wait, wha?